When ex-secretary of war, Robert MacNamara, apologized to the world for the war in Vietnam, and particularly for the excessive bombing that he had ordered in the north, he rendered an entire ten years of American history wasted. It was, he lamented, a betrayal of everything we had persuaded the world we stood for. 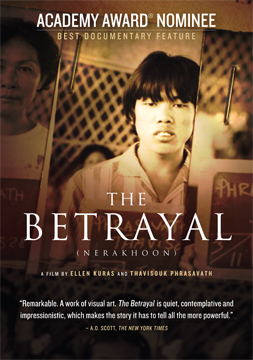 Ellen Kuras’ documentary The Betrayal brilliantly exposes the human effect of America’s betrayal through a compelling story of one Laotian family. But this film is so much more than a history lesson of our country’s hidden disgrace and the ugly truth about the Vietnam War; it is a universal, totally relevant and multi-layered saga of betrayal—by country, society, family and lovers. How a film’s title can cover so much territory is mind-boggling. Beyond that, The Betrayal does what documentaries can do best but which few filmmakers have the courage to undertake: to lead us on a lifetime journey (23 years) and show history as families experience it. Films are storytelling in a medium that is visual by nature, and Ellen, an exquisite cameraperson, never disappoints us. Her visual poetry is stunning. The camera moves carefully and meaningfully through the story’s long arc. An ancient Laotian legend of the coming of the Eagle of Destruction paired with a timeless opening scene of children riding the backs of great horned cattle rendered compliant by the swirling muddy river in which they are all engulfed makes us wonder if the characters will be caught up like this in a rush of history over which they seem to have little control, or will they be like these fearless children using the skills that nature has given them. The startling and memorable face of the protagonist, Thavisouk, is so lovingly caught as his story unfolds that we know right off that we will recognize everyone in this film as if they were our own family. And how many filmmakers would dare to tell the climax of the story with only pictures and music and end up with a scene full of such humanity we want to weep? Howard Shore’s music is a gift that most documentary filmmakers can only dream of. The plot of The Betrayal has the suspense that fiction films crave— escape, reunion, betrayal, death, love. Its themes are universal: fear of abandonment, unfulfilled father/son expectations, teenage rebellion, parental rejection, a mother’s undying love. But most importantly, the family’s story demonstrates the unbelievable capacity we have to survive throughout the ebb and flow of life. There were times we found ourselves aching with their grief because we understood its causes so exactly. Such themes have no cultural boundary. You cannot have a film about betrayal without it also being a film about deep love. Love of homeland is beautifully conveyed, as is the love of family. But it’s the bond between Ellen and her subject Thavi that is for us, as filmmakers, the most unique and moving. Thavi’s story truly becomes his story because with time he also becomes the film’s author, co-directing, shooting and editing with Ellen. In this visual art form, that began with photography’s evil reputation for ‘stealing the soul of its subject,’ Ellen’s final magnanimous collaboration with Thavi felt so right. There was no betrayal here. In the end, Ellen has given Thavi a gift—the tools to tell his own tale. And that is true love. D.A. Pennebaker and Chris Hegedus have been making films together for over thirty years. Don't Look Back featuring Bob Dylan was one of the first documentaries to screen in theaters. Their film The War Room, following Bill Clinton’s presidential campaign, was nominated for an Academy Award.